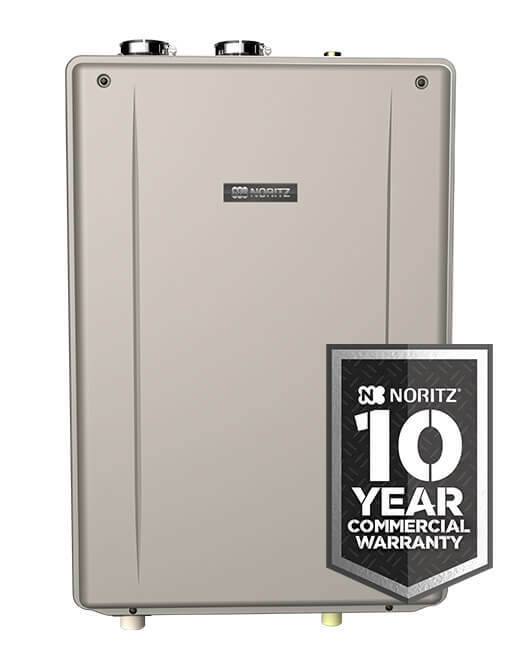 The NCC199CDV commercial condensing tankless water heater from Noritz has a thermal efficiency of 98% and is CSA-approved for common venting up to six units. 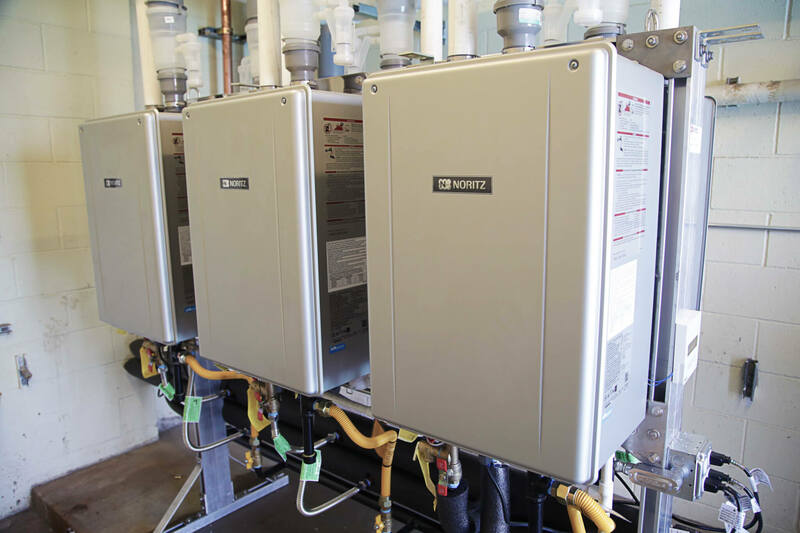 With a maximum input of 199,900 BTUs per hour (BTU/hr), the NCC199CDV features two austenite 316L stainless steel heat exchangers that resist corrosion from condensate and chloride, maximizing durability and lifespan. The NCC199CDV features an industry-best 98% thermal efficiency, eliminating the production of harmful carbon emmissions. Manufactured with 316L grade materials for high durability and corrosion resistance. · Multiple venting options: The NCC199CDV can vent directly, using either 2-inch or 3-inch PVC or CPVC or rigid polypropylene. As mentioned, up to six units can be common-vented indoors or installed outdoors with an optional vent cap. · Compact design: Weighing only 81 pounds, the compactly designed heater can be easily wall-mounted. Mounting brackets line up with the top of the unit, enabling installers to more easily position it on the wall. · Racking capability: The ability to combine (rack) multiple units offers peace of mind through redundancy: If one unit requires servicing, the others can continue to provide hot water. · Ultra-low-NOx, modulating Eco-Burner: The premix, fully modulating burner has a nitrogen-oxide emissions level of only 14 parts per million (ppm), far exceeding the South Coast Air Quality Management District requirement of 20 ppm. The burner optimizes the air/fuel ratio to continuously match energy consumption to present demand with pinpoint accuracy. The result: better efficiency with fewer moving parts. · High-altitude performance: The NCC199CDV can perform at an altitude of up to 10,000 feet. · WiFi-enabled: Compatibility with the Noritz Connect app allows the user wireless remote control of heater functions, as well as diagnostic and maintenance reminders. · Precise temperature controls: A remote thermostat can precisely adjust the output temperature from 100°F to 185°F. · Safety Devices: The NCC199CDV has several built-in safety devices, including a flame sensor, overheating and lightning prevention devices, freeze protection, and neutralizer overfill. An optional carbon monoxide alarm can also be connected.